It is through the fields and the songs and rhythm of nature that I welcome you to my beautiful Charentaise house, full of character. Two guest rooms and a cottage are at your disposal, according to your expectations, needs and the number of people. For a night, a weekend, or a vacation. 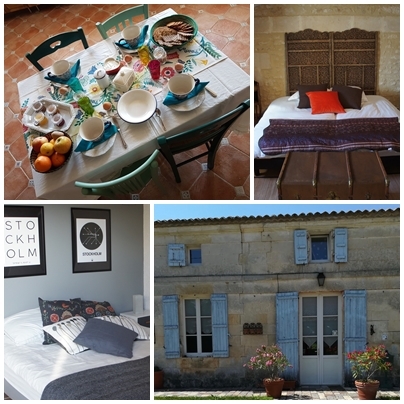 The house is built around 1860 and is close to Jonzac with its thermal baths and its aqua park "Antilles", just 35 minutes from the Atlantic coast with its beaches and islands, a very short distance from the estuary of the Gironde and its Bordeaux wines, and in the heart of the Cognac area. A multitude of cultural, sports or wellness activities await you. Your pets are welcome, having myself a dog and 2 cats. The guest rooms and the cottage all have different melodies, inspired by my travels and interests. Whether for one or more nights, enjoy a hearty organic breakfast prepared and served by me in the family kitchen.